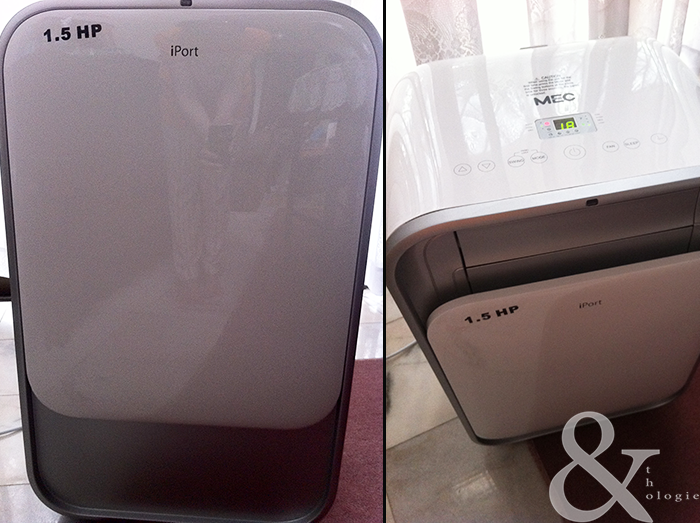 Left: The iPort when not in use. Right: View from above; it slides open when turned on. Let me start by saying, I hate waste - wastefulness to be exact. And when a purchase is done by someone else for example as a gift, or without consulting you, the chances of 'waste' is greater by, say 110%. That might be stretching it a bit but you get the idea. I would also like to say that none of these is MEC's or Fimaco's fault. Isn't the burden of due diligence lies with the consumers? Besides, we did not buy these directly from Fimaco. To give you an idea what an iPort is, as per MEC's website, the iPort is 'intelligently Portable'. It is basically an air conditioning system which is portable and doesn't require to be wall-mounted to use. Push it around and the iPort travels on its wheels - almost as big as one of those large wheeled luggage bags. Plug it and turn it on, it simply starts without much help. The portability however stops there. For one thing, you do have to deal with warm air that comes out at the back. Unless you're OK with warm air circulating your room, you do have to direct the detachable tube somewhere to let it out. There lies your problem. Mine, rather. The options are: to make a hole in your wall or use the supplied accessories on your window. There lies two more problems: making a hole in the wall is out of the question, and the kit only works with sliding windows or those that open vertically or horizontally. Mine aren't. Design-wise, it is very much right up my alley. If you have an iPhone or iPod or whatever 'i' device-themed decor, the iPort blends almost seamlessly. Also, it will be easier to take your air conditioner with you when you move house. I didn't buy these myself [we have two]. Had I bought these, I would have been very disappointed with myself for not searching and reading up on it, or seeing the unit in person before making a purchase. So, is there a happy ending to this story? Sort of. One unit is in my brother's room - he has improvised and the iPort is somewhat useable. The other one becomes a paper weight because there is no window in our living room [let alone a sliding one] and we haven't found anywhere else to use it yet. It's a very large paper. Yeah, you're right about wastefulness. I've got some experience with such conditioner several months ago. After that I've ordered a normal AC system with installation here http://myairmatics.com/. I hope it is good alternative to forget about that portable thing.